When GDRNT takes in a Dane from a local shelter, our plan is always to find a permanent home beyond the temporary foster home. We have a saying, “The foster home should be the second-best home this Dane ever knows. 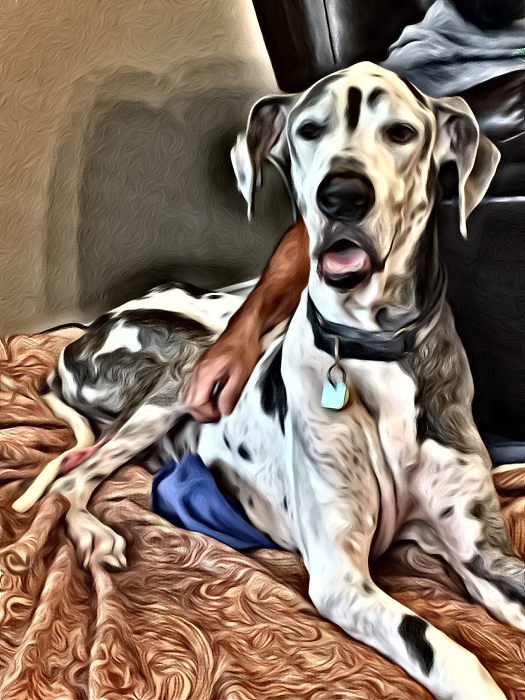 His furever home is the best.” Sometimes, no matter how hard we look or how many inquiries we get, a Dane’s furever is his foster. Oliver came to us at the ripe old age of 8 from a local shelter where he’d been turned in when major life changes made it impossible for his family to keep him. When our volunteer arrived to transport him she found a beautiful senior Dane who was terrified to be away from the family he had known his entire life. He was emotionally shut down and terrified of all the new things – new veterinarian, new home, it was all too much. With time and patience, Oliver began to relax in his foster home and trust that he had found a safe place to stay. His foster dad would not give up on him, stuck with him when his terror caused him to literally shut down. Visits to the vet, changing environments, even just touching his paws would cause him to completely shut down. His Foster dad did not give up and gave Oliver an environment he could feel not only safe but loved. He even made friends as other fosters came into the home and then left to join their fuever families. Oliver never left his foster home for a furever family. We searched high and low, but Oliver knew something none of us realized – he was already home. Oliver was happy, he knew he was FURever home and safe. Recently, Oliver let his foster know it was time to cross the Rainbow Bridge. After two and a half years, his body was failing him, making day to day harder to navigate. So, in consulate with our veterinarians, and his foster, GDRNT made the choice to let him pass peacefully.